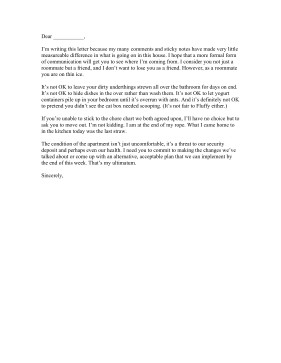 Roommates who are not contributing to household chores may find themselves the recipient of this angry complaint letter featuring an ultimatum. I'm writing this letter because my many comments and sticky notes have made very little measureable difference in what is going on in this house. I hope that a more formal form of communication will get you to see where I'm coming from. I consider you not just a roommate but a friend, and I don't want to lose you as a friend. However, as a roommate you are on thin ice. If you're unable to stick to the chore chart we both agreed upon, I'll have no choice but to ask you to move out. I'm not kidding. I am at the end of my rope. What I came home to in the kitchen today was the last straw. The condition of the apartment isn't just uncomfortable, it's a threat to our security deposit and perhaps even our health. I need you to commit to making the changes we've talked about or come up with an alternative, acceptable plan that we can implement by the end of this week. That's my ultimatum.